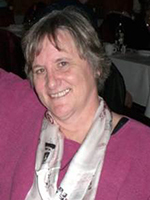 The Cathy Bray Essay award recognizes the contributions of Cathy Bray, Ph.D. to the development of the Masters of Arts in Interdisciplinary Studies program, to its students, and to Athabasca University. Cathy Bray was born March 18, 1955 in Kipling, Saskatchewan. She was raised in Saskatoon and after attending Evan Hardy Collegiate she received her Bachelor of Education in Secondary English and a Bachelor of Science in Physical Education from the University of Saskatchewan. She completed an M.A. (Sociology) at Queen's University in Kingston, Ontario followed by a Ph.D. at the University of Alberta in Edmonton. Her dissertation is titled “Sport, Patriarchy and Capitalism: A Socialist Feminist Analysis”. Cathy began her career as Director of Women’s Program and Resource Centre in the Faculty of Extension at University of Alberta where she worked for two years. She then became a professor in Women’s Studies at Athabasca University and during her seven years in this position proved to be an effective teacher and mentor whom many colleagues remember with great affection. One of her tutors who worked with her, Karen Nielsen, an Athabasca instructor, recalls how inclusive Cathy was in her approach to tutors and the effective ways that she mentored others. Karen recalls “a few months after I started at AU, she asked me to be a part of a discussion forum at the "Tutor Conference" on feminist pedagogy. I refused. I was almost phobic about the idea of public speaking. Cathy did not let me off the hook, she pushed (ever so gently) but firmly, offered help and guidance etc. She believed in me. In the end her support and encouragement convinced me that I might have something useful to say. I agreed and that was my first academic presentation. After that, she gently encouraged me to think about grad work and eventually I did my PhD in Adult Ed. I have presented at countless academic conferences since that first time but without Cathy's faith in me and her tenacity, I would never have shifted out of my comfort zone. She was an incredible person who had the ability to inspire by her leadership. I feel lucky and honored to have met her.” Cathy helped many achieve academic success and she was a supportive and helpful colleague. In 1996 Cathy found herself attracted to a new job in New Zealand, as a Senior Lecturer in Sociology and Women’s Studies at Massey College in Palmerston North. After four years in New Zealand she returned to Vancouver to live and once again work for Athabasca University as an Associate Professor in the new Masters of Arts in Interdisciplinary Studies program, developing several new courses for the program. Cathy also taught part-time at other institutions: Simon Fraser University; Justice Institute of British Columbia, Kwantlen Polytechnic University, Royal Roads University and University College of the Fraser Valley. Cathy's early death on July 1, 2014 resulted from Fronto-Temporal Dementia. While she was able, Cathy was active in Vancouver to raise awareness and funds for programs for people with fronto-temporal dementia. Her final act of teaching, her contribution to research and gift to the future was to lend her entire self to studies in FTD and movement disorders at both University of British Columbia and University of Saskatchewan. Who is eligible to submit an essay? Recipients of the Cathy Bray Essay Award receive a cash award of $500 and a letter of recognition that could be added to the student’s professional portfolio. The selected essay will be published on the Cathy Bray Essay award web site. The Ontario Sharia Debate: Helping or Hindering Muslim Women?